The ancient art of stone carving is millennia old and represents a timelessness and powerful poignancy suited to the reverence of, literally, the task in hand. 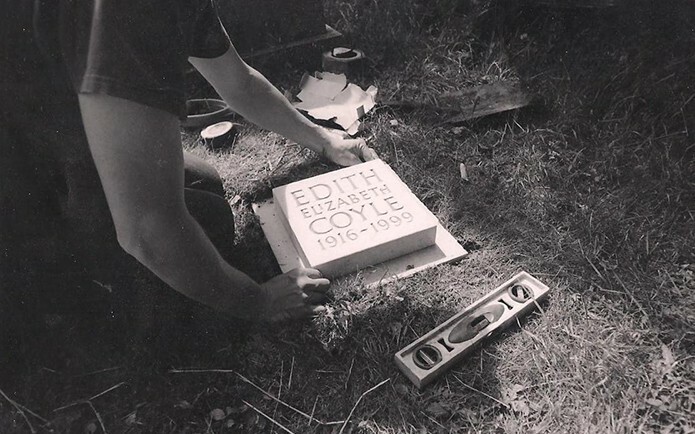 The responsibility of a stone carver is as heavy as the stone they work with, as their task is to capture the sentiment within the inscription of a few choice words deliberated upon by loved ones to create a commemoration worthy of the ‘someone’ they have lost. A hand-carved headstone when classically undertaken – in other words syntax & spacing studied, light & shadow considered, the perfect-faced stone chosen, crafting the stone to fit the letters, rather than the letters to fit the stone (which is all-too-often the case when stone carving is computerised and mass-produced) – becomes an object of sacred beauty. A hand-carved headstone, gently weathering through time, is a constant, as it is a lasting commemoration to an individual that will remain into posterity as a reminder to those that visit whether it is to simply pay their respects, lay some blooms, sit a-while to speak softly and reminisce, or feel a presence on the breeze…. Firstly, first those readers that aren’t familiar with Fergus Wessel and Stoneletters Studio, please can you explain what you do? 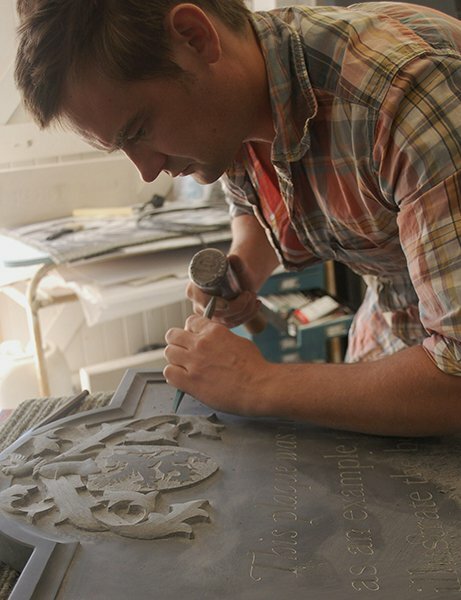 We are a stone carving workshop specialising in fine memorials, opening plaques and heraldry. 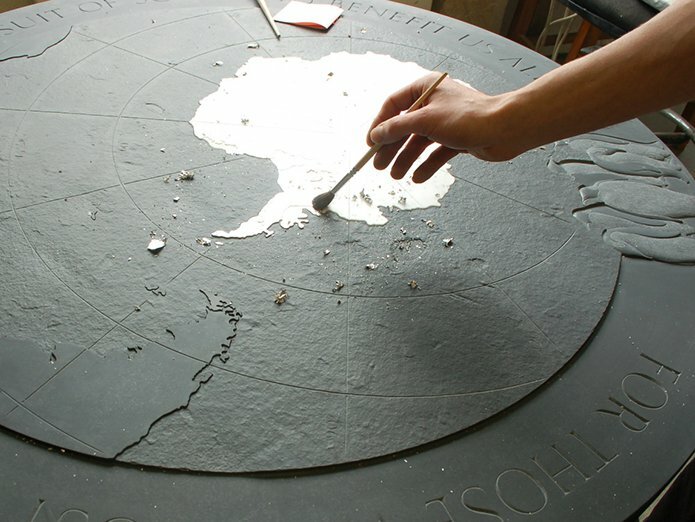 We’re different to most monumental masons, as we hand-carve letters, and carry out relief carving and heraldry by hand, rather than by mechanical means. 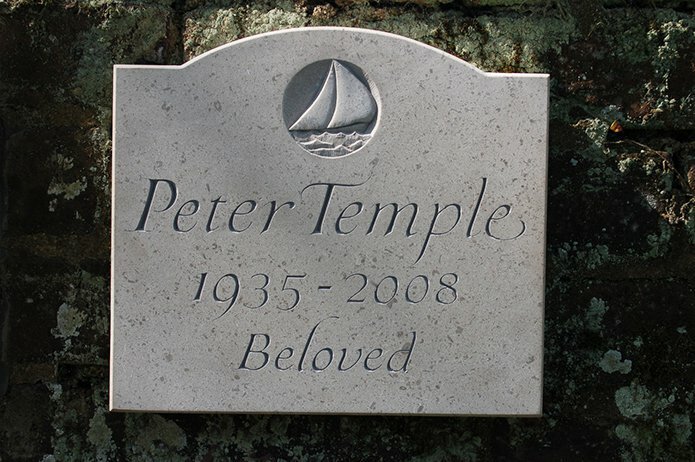 There are many applications for hand carved lettering, but it’s mainly headstones. Other works include opening plaques, foundation stones, coats of arms as well as carvings for sundials and obelisks, that sort of thing. 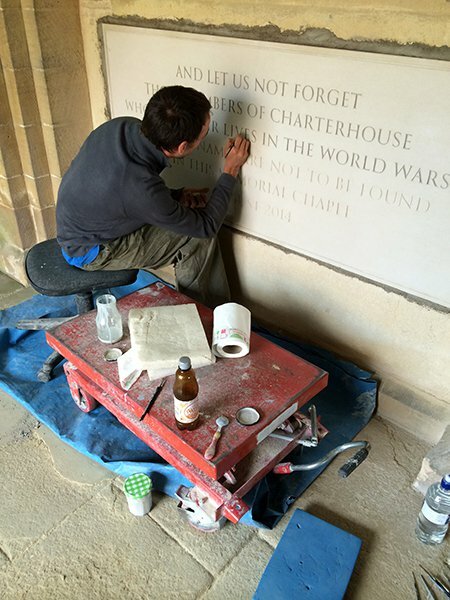 We have just taken on a commission to carve a memorial in the cloisters at New College, Oxford, for example. We take on any project provided that it fits in the workshop, and most of them are relief work, although when carving a coat of arms, they’re often ‘in the round’ rather than 2D. 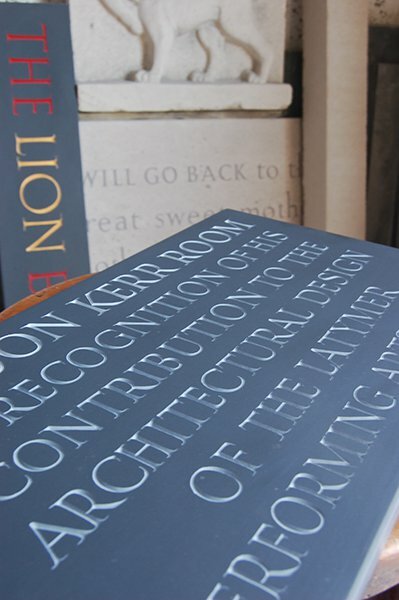 I set up Stoneletters Studio in 2003, straight after finishing a three-year apprenticeship. 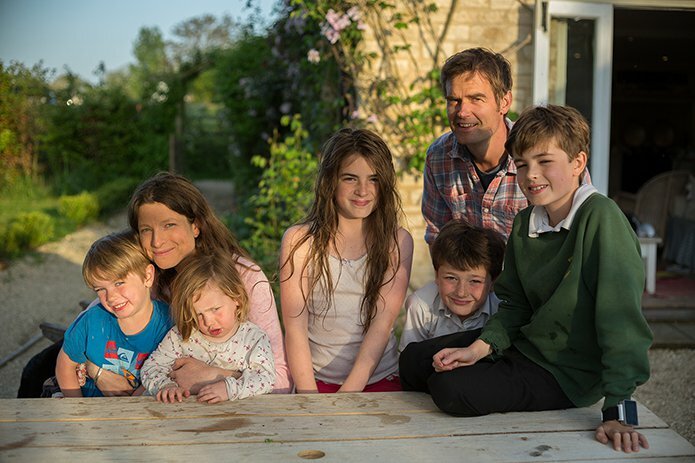 We’re based in Oxfordshire, but our clients are from all over the UK. Fergus Wessel and his family. What is the secret to good letter carving – is it the actual letterforms, the spacing in between, or something else? Preparation and layout are the most important things. Everything is in the drawing. If the typography is bad, and you start cutting, then it’s too late. People notice bad spacing more than a badly cut letter, and therefore it’s pointless being a good letter cutter if the spacing is out. The shape and rhythm of the inscription has to invite you in, and a good layout is easy to look at and nice to read, compared to an inscription where the letters are too close together or far apart or where the inter-linear spacing is too high or low, so balance is critical and this takes a lot of practice and patience to achieve. There isn’t any room for margin of error and for that reason I only ever work on a block of 4 or 5 letters at a time, as I have the ability to fractionally adjust the width of the letters if I’ve noticed the spacing is slightly out. 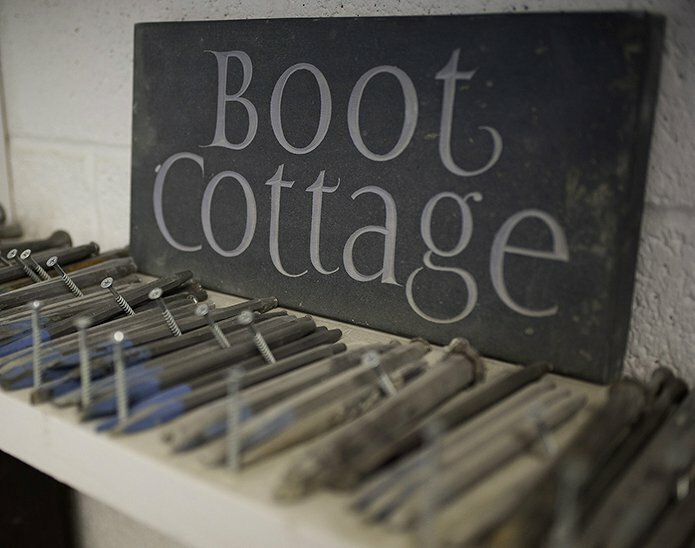 The secret to good letter carving is another thing, and that’s simply a question of practice and taking one’s time, and looking again and again! Is there a difference in the look of a stone cut & incised with a hammer and chisel, compared to being sandblasted by a machine? Yes, there’s a massive difference. Machines haven’t got there yet and I’m not sure if they ever will. 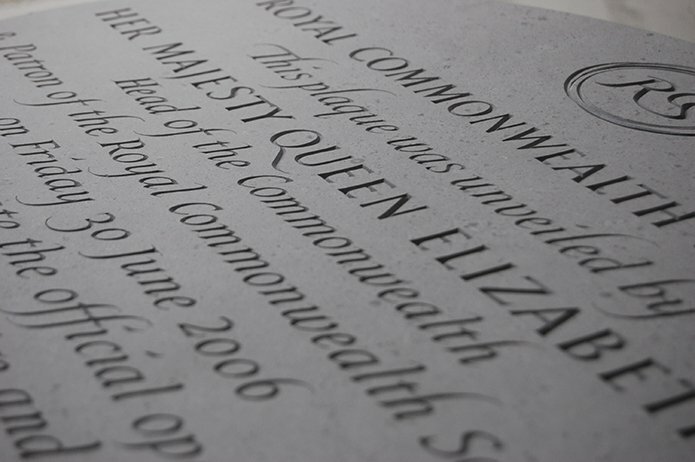 With sandblasted lettering there isn’t the same care and attention to spacing and layout. Sandblasted lettering will often be set using a stencil produced by computer. When drawing an inscription, sometimes the letter will need to be adapted very slightly to improve spacing… I think it’ll be a long time before these subtleties are achieved by computer. A hand cut letter has life, much like a pen stroke. If we take a capital “I” for instance, a hand-cut “I” is not actually a straight line, and has entasis, which means it’s narrower in the middle and flares out to counteract an optical illusion of concavity which the human eye sees if the correction wasn’t made. A sandblasted letter “I” would be machine-cut in a straight line, which visually wouldn’t look right. Another example is serifs, the decorative embellishments to certain letter forms, can be finely cut by hand. I’ve never seen machine cut letters look anywhere near as good as hand cut letters. The largest proportion of your work is carving gravestones, headstones and memorials. Why do you feel hand-carved lettering is the perfect art-form to mark someone’s passing and can a design impart a special message or meaning? It’s a monument we’re making, and if it’s thoughtfully made, the client is able to put more love into it, showing it is designed and cut with care and consideration. When we take on a commission, we’ll spend a lot of time talking with the client about the person who the stone is commemorating and gaining an insight into the character and essence of the person. We want to get to know that person; it’ll dictate the design a good deal and we can give off an impression of their personality in the stone. Many clients want an unusual design, and that’s possible with good letter cutting and spacing. The choice of letters is important as they give off a feeling, for example italics are relaxed and feminine with flourishes, capitals are more formal, whereas sans-serif is more contemporary. We can describe the character using letters. It’s not just gravestones, headstones and memorials this applies to, as it’s important for opening plaques too, as it’s not just a sign serving a purpose, but a thing of beauty in itself. 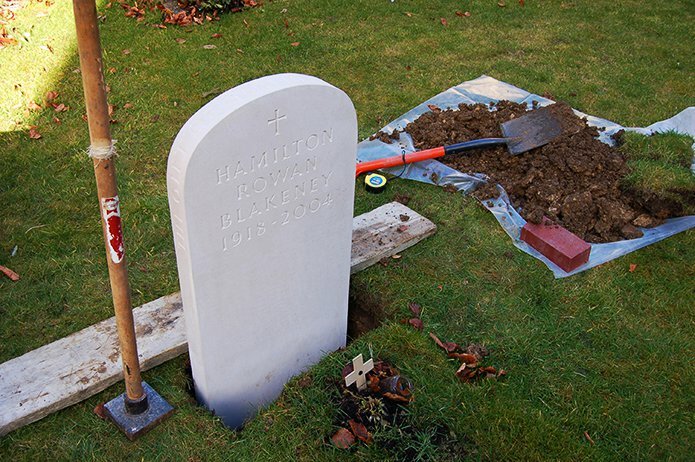 Can you briefly talk us through the process of commissioning a project, such as a headstone, and the steps that are taken? The first thing we do is meet with the potential client is to set up a meeting so we can meet each other. It is usually here at the workshop where there s always plenty going on and lots of examples in progress to look at. The meeting is an opportunity for the client to meet me, and for me to meet them, and we spend a lot of time spent chatting and understanding what they want, and during the meeting I can quickly get a sense of what they do and don’t like. Ultimately we’re working together as a team, and it’s very relaxed, which is so important. Sometimes clients don’t have a clue what they would like initially, and the meeting is an opportunity to discuss options, whereas others have a very clear idea at the outset. We’ll talk about wording, materials, sizes, character of stone, what the style is going to be like, amongst other things. I’ll then go away and create a sketch based on our discussions. I will normally only offer one drawing which we can then improve and adapt, rather than flood the client with lots of sketches showing different versions which I think can be confusing. 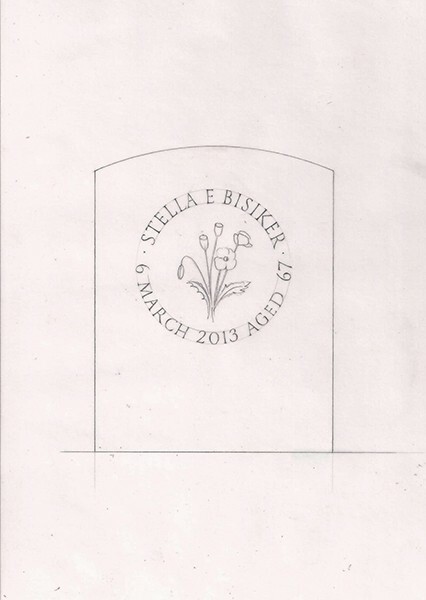 The design is then drawn out onto stone with a white watercolour pencil, which we can rub out if not quite right. We only use a ruler for the top line and baseline which will contain the letters within, and everything else we do by eye, which allows us to adjust and improve the spacing as we go along. This requires an incredible amount of discipline as if it’s not right, we need to rub it out and start again. By now the process will have taken a few months, although sometimes it can take much longer. It’s really important that the client is not rushed whatsoever. 3 years is the average before people start the commissioning process. Often clients feel under pressure to get something in the ground, maybe by other relatives or a funeral director. If I sense they’re not ready, then I will say to come back next year, and giving people space is really important. We work in a timeless atmosphere. I find that the longer the client takes in deciding on the inscription, the better and stronger it’ll be. Time allows for a sort of clarity. Choosing wording can be difficult. Many people want to begin with ‘In loving memory…’ which I feel doesn’t usually add much to the inscription; it is very overused and has therefore lost a bit of it’s impact. ‘Remembered with love’ is a nice alternative. I’m obliged to let them know different ways to express their love in words. 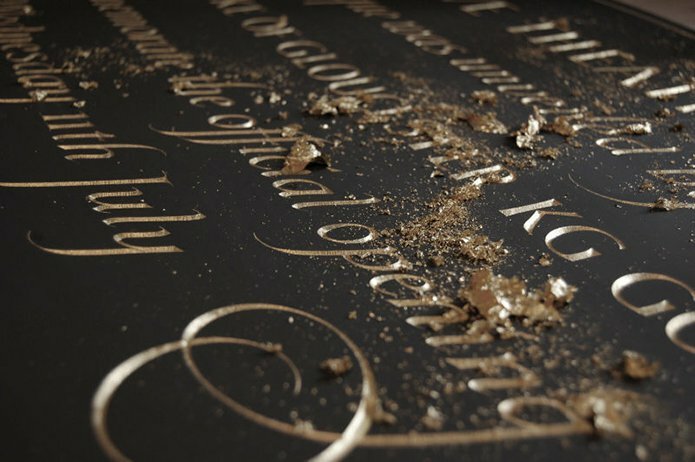 There is a growing trend in looking around old graveyards and reading inscriptions, and that’s all the more reason to think of words that will stand the test of time and be relevant to the reader…. 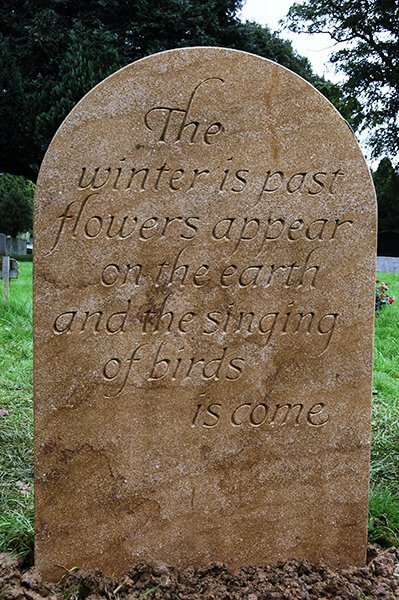 I personally like introducing lines of poetry, with a particular favourite of mine being the last line from Philip Larkin’s poem the An Arundel Tomb, which finishes: “What will survive of us is love”. I try to encourage people to really think about the wording, but it can be difficult, particularly if siblings can’t agree, so consultations can take a long time sometimes. Once the client is happy with the wordings, drawings and the price, I will then approach the cemetery and church in order to get a permit to erect a headstone in the churchyard, which can take a few weeks. Once the vicar realises we’re making something nice for the churchyard, they are usually on your side, which makes life easier! There is often a fear that we are going to introduce something cheap, black and polished into their churchyard! I will then order the stone. 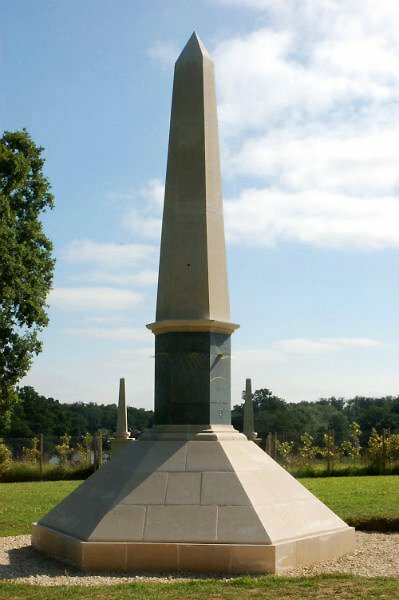 We only choose the dimensions of the stone after the inscription has been agreed, whereas with monumental masons, it’s the other way around, and you have to fit the inscription to suit the dimensions of the stone. I usually buy my stone and slate through a stonemason that I know very well. He will also shape the top of the headstone based on a template that I’ll provide him. It normally takes about ten weeks for the stone to arrive, and when it does, I draw out the inscription. The next, but really important stage is to invite client to come over and look at it the drawing on the stone, as we can still make some last minute changes to the previously pre-agreed design. 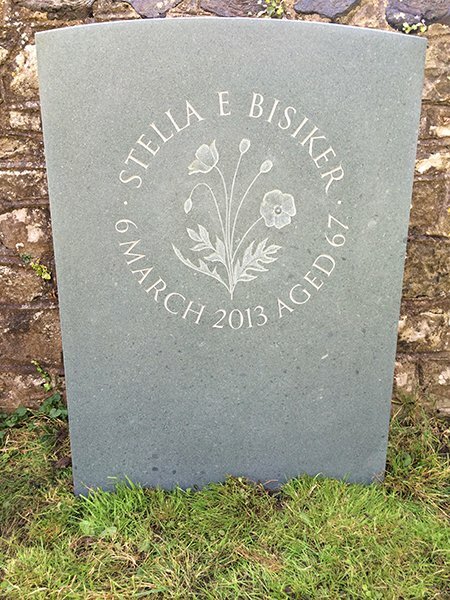 When a husband or wife sees their partner’s headstone in a churchyard for the first time, it can be a big shock for the surviving partner, but by coming in and seeing it being drawn out, this can lesson the blow if they witnessing the process of the making. Once a client has been in and they’ve checked it, we will then start cutting, and once that’s done, we’ll arrange a date to put the headstone in the ground and fix it in place. Clients differ as to whether they want to be there at the time, or visit when it’s already in place. I always like to be there when it’s put in the ground, as it would be terrible if it was put in wonky or worse, it got scratched. Overall, it normally takes 6 – 9 months from start-to-finish, but it could be done sooner if we have less work on. The minimum time would be 3 or 4 months though. Compared to going to a monumental mason, where it’s possible to choose a headstone off the shelf and have the stone sandblasted within a week, we’re obviously not fast, but we feel there’s a lot more love and care in what we do. It’s not just about letter cutting either; it’s the entire process, from consulting with the client, designing, getting the typography right, drawing out and carving, as well as selecting the right materials, dealing with quarries and stonemasons, the churches, vicars and cemeteries. Above all, it’s liaising with clients to give them something really important to them that’ll last. How do you select the materials that you use on a project, and do you have any preferred stone? If I’m selecting stone for a churchyard, I’ll choose natural unpolished stone relevant to the area i.e. limestone, granite, slate etc. I don’t offer a huge range of materials, and try to use British stone whenever I can, but given so many British quarries are closing down now, sometimes I’m forced to source stone from Italy. The stone we choose is very much embraced by vicars, as they’re tired of black polished Chinese marble or mass-produced granite destroying the natural beauty of their churchyards, and would prefer stone that blends naturally in to the environment that gently mellows with time, but we’re probably fighting a losing battle. Churchyards aside, the choice of stone depends on the job and what the client wants. As to which is my preferred stone, I don’t really have a preference, as each one is different with their own qualities. For instance, I have recently been carving 10 inch high lettering on a temple made from hard York Gritstone up in North Yorkshire which smashed up all the chisels that I was using as it was so hard, whereas had it been Portland stone, it would have been like cutting through parmesan! I do a lot of work in slate, which is very clear, hard, and consistent and shows mistakes, so you need to demonstrate a lot of control in your work, but the finished carvings look really beautiful, so I guess, if pushed, that would be my favourite material to carve on. Historically, I used Welsh slate, but there’s only one monumental slate quarry remaining, which is very expensive and not that nice to carve, so I’ve switched to using Cumbrian slate. You originally trained as a potter; why did you decide to retrain and had you any had any exposure to letter carving practices before? I’ve always had a love for carving, and I can still remember when I was six years old creating stone carvings in the garden with an old screwdriver and hammer. As I grew older I originally wanted to be a sculptor, but people talked me out of it saying that pottery would be a more commercially-viable career choice, and so, after leaving school, I enrolled on a ceramics course and then became a thrower at Winchcombe pottery, which I loved but in truth my heart wasn’t really in it. I found that working as a potter is wet and cold toil and found it a bit monotonous, particularly if you’re making 300 ashtrays for a pub down the road. Stone was always there in the background. There was a sculptor at a workshop opposite the pottery I was working at and I used to spend time watching him at work, and I found it amazing, watching him carving with his range of tools. I reached a point in life whereby I decided to work full-time with stone, and thought that with letter cutting I could earn a reasonable living, certainly compared to being a potter, and so I changed careers. 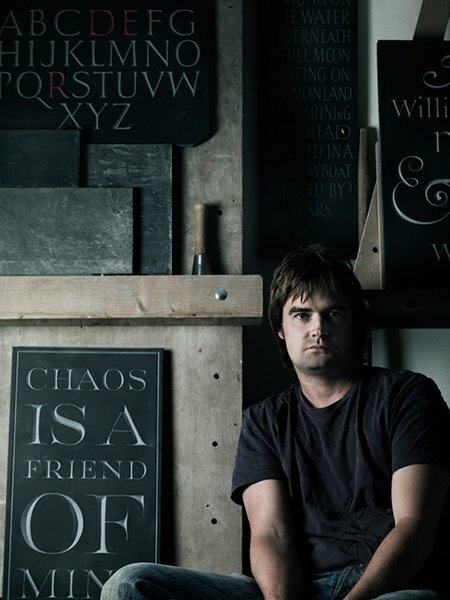 I had exposure to typography, as my mother was a typographer at a private press, and whilst fine carving is not a very large industry, I was fortunate to get an apprenticeship in a Cambridgeshire workshop. Some people who haven’t tried letter cutting remark on how mundane the work must be, but once they try it, they quickly change their minds! it’s incredibly absorbing. I used to feel so bad about abandoning a skill I devoted years to, but it was the right decision and I love what I do now and I’m completely absorbed in this world, so much so, that I haven’t thrown a pot since. Were any of the skills you learned in ceramics transferable to stone carving? When I changed from being a potter to a stone cutter, I was worried that I would be throwing away all the skills that I had learnt. However, I’ve since realised that life isn’t really like that. Many of the skills that I had developed were transferable to letter carving. The core skills are different, as with pottery you’re throwing with hands, whereas in stone cutting you’re cutting with tools, but it’s more about the approach to workshop life – and the discipline within – and the ‘looking’ skills, such as getting the shape right and knowing that a curve has to have tension, irrespective of whether its cutting a letter C or the curve of a bowl. What are the essential letter carving tools that you use? For drawing the inscription you need a sharp pencil, rubber and a ruler. The pencil will be a water-soluble pencil for slate or a 6H lead pencil for limestone and marble. The sharper the pencil, the easier it is for drawing out, so we use a fine grade of wet and dry paper to get a really sharp end. The rubber needs to be of very good quality to avoid the potential for smudges. For carving, you need safety glasses, chisels and a mallet, which we call a ‘dummy’. 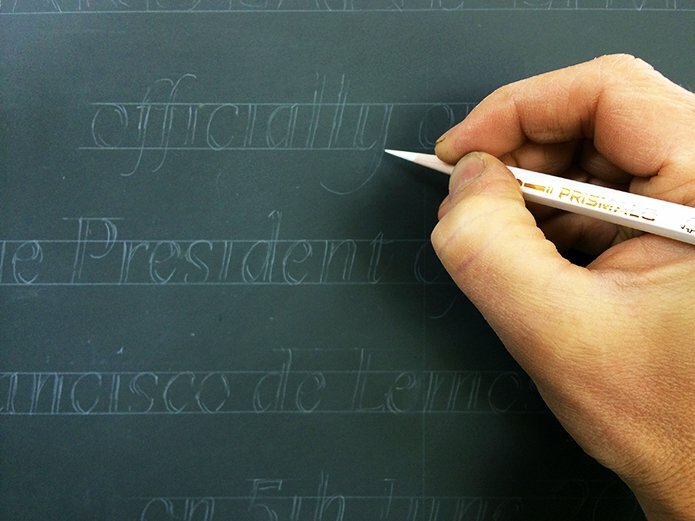 We use one chisel for one inscription, and the choice of width of chisel is the same as the width of the stroke of the letter, so a 6mm wide stroke requires a 6mm chisel or just slightly bigger. We use steel chisels with tungsten tips, which are extremely hard, but brittle if dropped, and we keep them really sharp by using a diamond whetstone coupled with water. Without a really sharp chisel it’s impossible to carve a letter precisely. My preferred chisels are by Al-Orr. 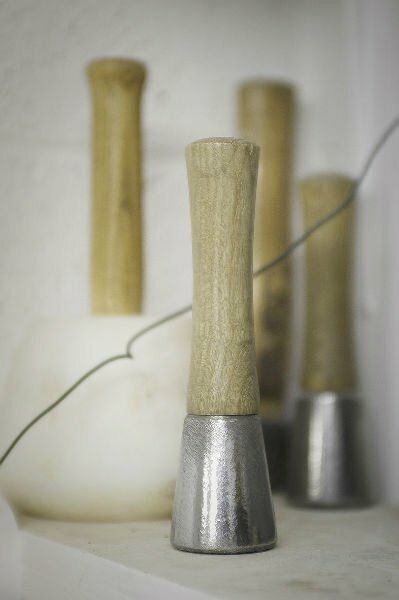 We use a round metal ‘dummy’ instead of the nylon or wooden mallets that are used in masonry. What advice would you have for someone considering a career as a stone carver? Without any doubt it would be to do an apprenticeship over 3 or 4 years. Skills are passed down from master to apprentice, through teaching by example rather than criticism, so you need to be in that environment, learning all the disciplines and lessons of letter cutting, being free to ask lots of questions and knowing how to deal with clients. The length of time is takes to learn is one reason why people don’t go into this craft, but once learned the skills will last a lifetime, and you can literally go anywhere around the world carving. It’s very hard to get an apprenticeship though, as there are only a few places in the UK that provide training. To be in with a chance, you’ll need to display the right assets: patience, quietness and an incredible willingness to learn. Once you’ve gained your experience, and decide to start out, this can be a difficult as it’s hard to get trusted by anyone, so you have to look at ways to build a client base. I certainly found it difficult to get people to trust me when stating out and so I was prepared to do lots of things without making any money. To what extent are letter cutting techniques transferable to relief carving and heraldry? They’re very transferable as the masonry techniques and disciplines are the same, and in fact carving techniques are exactly the same in 2D as they are for 3D. At the end of the day it’s basic masonry, for example knowing whether the stone will chip or not, and understanding light and shadows, as that’s what you’re reading, and just looking and having discipline. Have you created your own technique for carving letterforms, or do you follow traditional and established stone cutting techniques? I follow established techniques as there is only one way. Everyone develops their own technique and depth to a certain extent, but they’re rooted in traditional and established cutting techniques. The great carvers of the past: the Egyptians. They were the ultimate; the best. They really understood stone, and their spacing and detail was simply brilliant. The Aztecs were great as well. Whilst the Greeks and Romans were good technically, the Egyptians really understood form. Looking at a Greek carving does not give me the same feeling in the pit of my stomach as an Egyptian carving! Famous letter cutters of the past inspire me, such as Eric Gill and David Kindersley, and I’m also inspired by letterpress printers for their sense of design. I also love going into churches and reading the old inscriptions. What advice would you give someone considering a commission? Take time – that’s the really important thing. Look around for ideas and inspiration. Be open-minded and to give me a bit of artistic rein and licence! In the workshop, to carry on doing exactly what we’re doing. On a personal level, I’d like to study Egyptian art more closely. 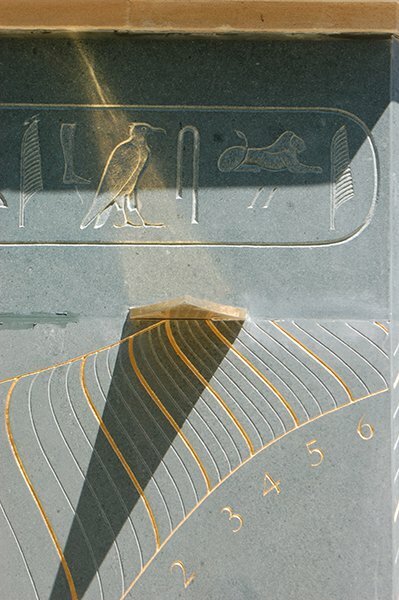 I recently spent some time in the British Museum with an Egyptologist learning about hieroglyphs and their similarities with letters for a large sundial project I was working on. I’m also waiting for the big commission that will encompass everything that I’ve done and learnt to date. I’d like to do more of my own sculptures, but at the moment I don’t have the time to do that as I have a mortgage and family to feed, and as all our work is commissioned, I don’t have the opportunity to really let fly, but that’s something I’d like to do more of in the future. Thanks to Fergus Wessel for taking time out of his busy schedule to answer our questions. All images courtesy of Stoneletters Studio.